I just finished updating the list of 50-50 colleges with the latest IPEDS data release and thought I would share some statistically non-significant (as far as I know) observations. For those who don’t know what I mean by 50-50 colleges, these are colleges that accept at least 49% of students and have at least a 49% graduation rate. There are currently 486 such institutions with at least 500 or more full-time undergraduates. The reason this is such a big deal is that it represents less than a third of all four-year colleges. If you include schools that accept less than 49%, you add another 153 colleges to the list. That’s still well less than half of all four-year schools. So, yeah, it’s kind of a big deal. If you want a copy of the list, you can download it here. Now for the interesting information I was talking about. There are only three schools without 50-50 schools compared to four from last year. Montana added one private and one public school to list. The total number of private schools increased from 286 to 301 and the public from 177 to 185. Of the 40 schools that dropped from the list, all but 2 were because of a decrease in graduation rates. Wheaton College in Massachusetts dropped its acceptances rate to 48% and the graduation rate information is missing for Gordon State College. I added another 63 colleges that didn’t make the list last year. 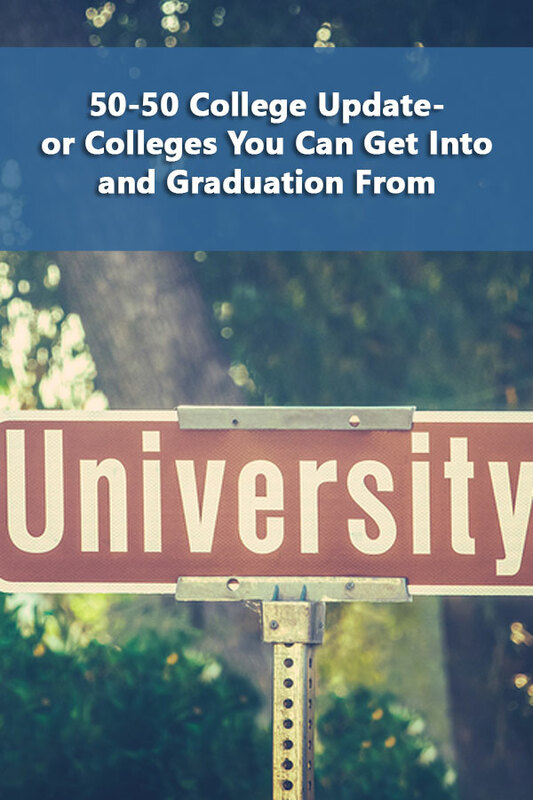 There are a lot more smaller 50-50 colleges than larger ones. This isn’t surprising since the same is true of colleges in general. I’ve brought this up before, if you want more college choices, you need to consider smaller schools. Furthermore, if you want more affordable college choices, you should consider smaller schools. Among private 50-50 colleges, the smaller, the lower the average net cost with the exception of the largest schools. The fact is that supply and demand exists in higher education. There are more smaller schools and they are less popular so they offer discounts. On the other hand, the popular Goldilocks schools, don’t have to offer lower prices to get students to attend. For those looking for test optional colleges, there are 30 50-50 schools where the SAT/ACT is neither required nor recommended. If you’re considering test optional schools, be sure to check if test scores are used in awarding merit aid. You may need it since it looks like test optional schools charge more. 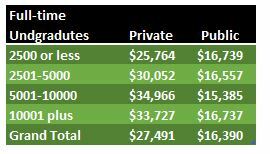 Private colleges where tests are neither required nor recommended had an average net price over $4,000 more than those where the tests are required. Maybe it’s to pay for the additional admissions staff to do holistic evaluations of applications. All of this information is available in the 50-50 listing as well as athletic division, graduation rates, and acceptance rates. You can get the information on all colleges in the DIY College Rankings Spreadsheet.